German stewardship in SWA/Namibia spanned three decades from 1889 to 1915. Bismarck had achieved German unification in 1871 and German South West Africa became the first colony of the new Empire under Wilhelm l in 1884. Four years later his 29-year-old grandson Wilhelm ll, popularly known as the Kaiser, ascended to the throne after a short reign of Frederick lll. The Kaiser's characteristic impatience soon brought him into conflict with the elder statesman, Bismarck, whom he dismissed from chancellorship in 1890, achieving his underlying wish to govern in person. The era known as Wilhelminian, notorious for its erratic course of German policy and international blunders, is paradoxically the era which witnessed fundamental changes in artistic, architectural and intellectual life in Europe. Unparalleled technological and scientific advances took place, Germany became the greatest industrial power in Europe and in this era the symbol for world quality "Made in Germany" was first imprinted on all goods exported to England. Within this background developments in GSWA must be viewed. SWA is a highland with an average altitude of 1200 m above sea level, its capital, Windhoek, lying at 1620 m. The plateau drops steeply to the Namib Desert stretching along the Atlantic seaboard. Natural harbours are L?deritzbucht (Angra Pequena), in the extreme South, and Walvis Bay already annexed by Great Britain in 1887 for political reasons. With the exception of the border rivers and the Fish River, all rivers are dry river beds. Rainfall is slight - the period December to April being the rainy season - and decreases from North to South and from East to West, Windhoek receiving 225 mm p.a. The Tropic of Capricorn divides the territory; the interior with continental climate experiences high temperature range. These climatic conditions demand different building technologies between the coast and the interior. SWA had not been previously colonised and the Germans could draw on little previous experience. The Namib offers no materials fit for building. In the Interior only quarried stone or sun-dried bricks are available. Clay for fired bricks is scarce and of a poor quality. Because of the lack of straightish trees, timber cannot be considered as a sound building material. The development of the colony by its German overlord was slow and hesitant. Windhoek, the capital, was occupied in 1890 and a fort built along the lines of a typical Roman Military Camp by the colonial troops. In due course the territory was defended by a chain of strongholds and outposts. As temporary accommodation, settlers were recommended to build Hartebeest houses (1). Only with the introduction of the Directorate of Building Services of the Imperial Government of GSWA in 1897, the decisions to build an artificial harbour at Swakopmund (just north of Walvis Bay at the Swakop River mouth) and a railway from there to Windhoek, and the floating of a cement-brick company with branches in the coastal towns can one begin to talk of a building industry. 1. In all colonies the architectural ideas of the mother-country were received after a certain time lag with adjustments locally determined. This typical appearance also applies to GSWA. 2. Non-typical was the rapid reception of isolated architectural tendencies taken from the internationally progressive mother country from about 1903. 3. In contrast to contemporary foreign influences, an indigenous or regional style developed, a speciality pioneered by the Directorate of Building Services. For the railway station building in Swakopmund of 1901, the rational architectural vocabulary of the Rundbogenstil was chosen (2) and merged with Renaissance features. Deviating in form and in detail was the typical Wilhelminian element namely the pyramidal spire with flared eaves, probably ascribable to Wilhelm Sander, an architect with a medievalist bent, commissioned with the completion of the building. Sander, most prolific architect/builder in GSWA, studied architecture in H?xter in Westphalia and practised in Berlin prior to emigrating. His Paul Emisch House of 1894 in Lichterfelde, Berlin, is today a national monument in the former Imperial capital and the subject of local postcards (Fig. 1). 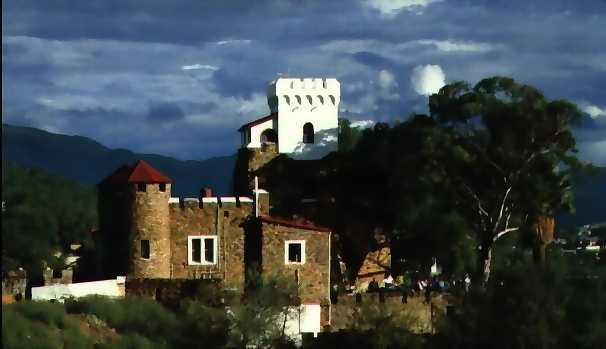 His masterpieces in Windhoek are the three castles: Schwerinsburg 1914, an adaptation of the 1890 belvedere Sperlingslust with refectory, great hall and keep grouped around an inner ward of an enclosing curtain wall; Heinitzburg originally a donjon built for himself and converted in 1916 into a castle with surrounding bedrooms enclosed by a castellated wall with angle towers; and Sanderburg, 1917, a three storeyed donjon for himself with sunken bath in the bay window! His commercial buildings, Gathemann 1913, and the Genossenschaftshaus 1910, in the Windhoek main street (aptly named Kaiser Street) can be regarded as his most successful urban buildings and are usually referred to as one complex - a compliment for an architect. The typical Wilhelmminian architecture began with the Reichstag building in Berlin, 1884-94, by Paul Wallot and characterised by ostentation and flamboyance, is rare in SWA and can be ascribed to the fact that the colony only really began developing during and after the calamitous Herero-Nama uprisings of 1903-07. No other building achieved the degree of decoration of the neo-Baroque and Renaissance Hohenzollernhaus of 1905-06 in Swakopmund, its ornamental and figurative stucco allegedly the work of Croat migrant railway labourers. In Windhoek it is Otto Busch who excelled as a villa architect, his Villa Lanwers of 1908 resembling contemporary villa concepts in Germany by distinguishing functions between floors: the kitchen and dining room banished to the basement, the lounge and drawing room on the first floor or piano nobile. During 1913-14 Busch built a Villenkolonie, a complex of six lettable clusterhouses in the capital (Fig. 2). This was the only attempt at medium density residential accommodation in GSWA. According to Posener (3) Wilhelminian architecture can be divided into two epochs, the second beginning in 1904 after the return of Hermann Muthesius from England. Determined to become the top nation, Imperial Germany dispatched architects to some of its foreign embassies, Muthesius in London from 1896 to 1903 having been assigned the specific task of studying British Architecture and design. He liked England and was ravished by its domestic buildings catching especially the Arts and Crafts architecture in its brief movement of bloom. The chief characteristics of the Arts and Crafts approach to architecture were freedom and practicability: the qualities of giving each room appropriate orientation, shape and size, and openings and massing determined by function and not by arbitrary rule or the constraints of classical design, qualities Muthesius praises again and again. On his return to Germany Muthesius produced three books, the greatest and most influential being Das Englische Haus (4) in which extraordinary thoroughness he catalogued especially the English turn-of-the-century house. The principles of Arts and Crafts architecture were readily adopted in Germany, emulations even reaching its colonies. The Damara House in Swakopmund of 1904/05 by the house architect of the company Friedrich Hoft is the best example. The loose planning arrangement corresponds with English architectural conceptions, compare R. Norman Shaw's Leyes Wood of 1868 or Lowther Lodge of 1874 (5). The main rooms are north-facing for comfort and convenience, doors and windows are placed to obtain maximum light, ventilation and view and the roof overhangs where for sun control reasons they are necessary. The exterior of the building is developed from its internal conditions, the free symmetry accentuated by the grouping of major elements. The upper floor is timber flamed recalling the Landhaus and corresponding thereto Hoft similarly expressed the tower structure. Historicist and Jugendstil motives are used, but sparingly. The hospital of the Order of S. John of Jerusalem 1912/13 by Mohr and Weidner also conforms to the "Free Style" advocated by Muthesius and it is interesting to note that this building stands in Keetmanshoop, the town closest to the neighbouring British Colony, the Cape of Good Hope. In this way a gentle architectural transition from the Cape to GSWA, from English to German practice was effected. The design of the dwelling house of 1908 on the farmstead Gras in the Maltah?he district most likely also stems from Friedrich H?ft and follows the Landhaus principles of Muthesius (Fig. 3). Instead of adding a veranda to the north elevation which very often results in dark internal rooms, H?ft provided the building with a pierced arcade modulating its width to create useful space, an architecture related to life. Hence the arcade not only re-affirms the need for sun control, but provides a look-out niche off the doors of the master bedroom and a large, airy seating place on to which both dining room and lounge open; a present-day photograph along the walkway reveals its fine spatial definitions making the functionally necessary veranda a successful human environment. Yet despite its fitness of purpose the house still clearly reveals its dependence on German vernacular forms, as the Arts and Crafts approach to architecture advocated. The first German Protestant church in SWA, the Christuskirche was built in Windhoek from 1907-10. The design by State Architect Gottlieb Redecker was governed by the clauses of the Eisenacher Regulativ of 1861, a set of guidelines for the design of German Protestant churches. The church faces East, the basic Latin cross plan is supplemented by an additional side aisle and a narthex. The transverse arms of the Latin cross are however not used to form a transept, but accommodate the sacristy and staircase to either side of the choir. Curvilinear stepped gables terminate the roof alluding to the Jugendstil movement to which Redecker subscribed in 1907. The church is essentially a Neo-Romanesque building yet the displacement of its elements and rustication cannot be accounted for the reference to German Romanesque revivalism. Besides the English influences already alluded to, American influences also reached Germany by way of its cultural attaches. Posted to the Washington embassy was Karl Hinckeldeyn who published the first serious study on American architecture, well before the Wasmuth Monograph on Wright. In his book Neubauten in Nordamerica, published in 1897, Hinckeldeyn asserted that the German architectural profession should study American architecture which he designated as inventive, strong, purposeful and practical. In his opinion Richardson was the finest American architect of the time and his work is given prominence in the book. In this way and through the German architectural journals Richardson's style wad diffused in Germany. The asymmetrical location of the tower of the Christuskirche, the adjacent body of the building, the pure geometry of the rose window, and the large arcuated side windows recall the similar organisation of the Brattle Square church of 1870-72 by Richardson. Carrying further this analogical analysis I became convinced that the rustication, the continuity of the wall plane, and the lack of pilaster strips and blind arcades on the Christuskirche were chiefly a Richardsonian inspiration. The contemporary German Romanesque revival used smooth walls and a Rhenish-Romanesque vocabulary and as Gideon has shown, rustication in the modern period is pre-eminently an American usage. The warding off of Historicism by resorting to Jugendstil is manifest in the Swakopmund Protestant Church of 1911 by State Architect Otto Ertl. This design was based on the subsequent guidelines for the design of Protestant churches, the Wiesbadener Programm of 1891. Choir and nave are fused and the focus is a Kanzelaltar, an 18th century Protestant speciality whereby pulpit and altar are integrated giving each equal visual and aural emphasis. Of great importance in the Wiesbadener Programm was the promotion of an architecture growing out of the needs of the time. The official Wilhelminian architecture is a soulful Neo-Baroque, and Ertl's response was to simplify the forms in plan and in massing as pure stereometric forms. The flowing Baroque forms become stiffened and geometric as the late Jugendstil dictates. This endeavour is especially noticeable in the parsonage. The house is conceived of as a simple cube with hipped Mansard rood - its wall surface divided into rectangular field, alternating fields containing decorative squares in their top corners. The centre of Jugendstil architecture is L?derizbucht, the southernmost town of SWA which only really developed after 1908 when diamonds were found in its hinterland. Emil Krause, formerly in the employ of the Directorate of Building Services was the main protagonist. One of his first projects was the commercial building of 1911 for Messrs Schuster and Metje in which a curvilinear decorative gable is perforated by towering pilasters crowned with torches. As in many of his other projects surface play of decoration is effected by smooth and ruled plastered fields. His warehouse of 1912/13 for the Carl B?dicker Import Company (Fig. 4) reflects other influences besides the Jugendstil decorations. Its adaptation of the classical canon and especially the faceted gable are features the great German father of Modern Architecture, Peter Behrens, employed. Otto Braune's 1912 regional hospital in L?deritzbucht (Fig. 5) perhaps displays more obviously its principal dependence on Behrens. The stark rectangularity, the bent gables, the pilaster strips which stretch into the gable and the steep pyramidal roof form are strikingly analogous. Only the checkerboard frieze cannot be ascribed to Behrens; notably it is a motive used by Richardson, in eg. his Austin Hall in Cambridge, Mass. of 1881. All these European or American-European architectural currents are received in GSWA within a surprisingly short time interval. The Directorate of Building Services in the 18 years of its existence and primarily under the State Architect Gottlieb Redecker (first architect born in SWA - in the pre-colonial era as the son of a missionary colonist) developed an independent architecture based on locally available building materials, determined by climatic conditions and restricted by meagre budgets. Under these conditions the "SWA Veranda Style" was developed and applied consistently in modest dwellings of officials, administrative buildings and in the central government building. In Africa such consistency has few parallels. The first buildings of the colonial troops already contained verandas. Verandas are necessary to protect the sun-dried mud brick walls and to cool the rooms lying behind the walls. In the main, however, they provide desirable living spaces, screened from the direct rays of the sun and exposed to the cooling breezes. Their architectural solution however initially remains no more than a utilitarian response to a structural problem. The refinements of the veranda architecture first appear in the 1902 additions to the house of the deputy troop commander (Fig. 24). The classical proportions of the body of the building and of its details are striking. The veranda piers are of brick, the only locally available building material, and for their architectural execution the analogy is the classical order of base, shaft and capital. Attention is particularly drawn to the necking and the three corbelling consoles, perhaps a stylised translation of the Corinthian capital (Fig. 25). The veranda roof is articulated from the main roof and its pitch is shallower. The bearers provide support for the rafters which overhang and are profiled. A roller blind may be hung from the bearer and affixed to the balustrade wall as a barrier to sun penetration and to diffuse radiation. The lightweight corrugated iron veranda roof and the roller blind effectively shade the mass of the building from solar radiation and keep the house cool during the day. Air trapped within the veranda space may by gravity emerge through the apertures between bearers and corrugated iron sheets. At dusk, roof and blind, because of their lightweight nature, cool quickly allowing for the cooling of the outside of the heavy-weight walls of the house resulting in lower internal temperatures during the heat of the following day. It is perhaps for these reasons that Ludwig von Estorff who for many years inhabited the house, in his memoirs recorded that even in the strongest blaze of the sun, the house always remained cool. Fixing the gutter brackets directly to the exposed ends of the corrugated iron cannot be considered as sound building technology, nevertheless many such solutions still survive. Due to the wide variety of works of architecture in SWA sharing the veranda details and the pedimented roofs, often corniced and provided with plinths or acroteria, they can be said to belong to the same style: the "SWA Veranda Style". During 1908 the secretary of state of the Colonial Office, Bernhard Dernbug, undertook an inspection tour of GSWA. For his visit a new house was especially built and as cement roof tiles were now being manufactured these were, for the first time, used on this house. Due to the need for a steeper roof pitch when using tiles rather than corrugated iron, the veranda roof, until then articulated separately, became integrated into the large hiproof. The veranda piers, however, adhered to the brick translation of the classical orders. The roof tiles were fraught with difficulties and proved totally useless. Yet the house already pointed to the course the Directorate of Building Services was to follow in the last years of German dominion when verandas were fully integrated and applied only to the elevations on which they were climatically necessary i.e. on the northern and western elevations. The shallow pitched saddle roofs were displaced by steeply pitched hiproofs. The apogee of the SWA Veranda Style and the warding off of the German or motherlandish image is nowhere more apparent than in the Tintenpalast, the central administrative building of the Imperial Government, dubbed "palace of ink" for the volumes of ink used by the bureaucratic "pen pushers" it housed. In February 1910 three sketch designs by the Directorate of Building Services were dispatched to Berlin. The plan of the first design shows an elongated main wing with double-loaded corridor giving access to numerous identical offices and two side wings extending the rear. The plenary chamber of the territorial council is located in the upper floor of the centre projection and visually emphasised by the hipped mansard roof. The main wing is also terminated by two projections, the overall appearance tending towards a French Neo-Baroque. In the second design only the arcaded front and the veranda surrounding the rear differ from the plan of the first). The arcading can be said to be an adjustment to climate, the facade containing a fusion of Neo-Baroque and Italian High-Renaissance elements. The third design contains an additional rear wing placed on the axis of symmetry housing the plenary chamber. In elevation, the terminal projections have been done away with, the lower floor of offices is sheltered from the influence of the sun by an arcade, the upper floor by a veranda with separately articulated roof. A variant to the plan is included doing away with the double loaded corridor, the offices being given access off the verandas. The Imperial Colonial office in Berlin decided on the last proposal. Practical changes were however to be made: room sizes to be determined by their function and in order to provide better daylighting the arcading to be replaced by trabeated construction. These charges were made and a revised plan sent to Berlin which also integrated the veranda roof into the main roof. Amendments made to this plan led to the final design. Significantly these stem from Friedrich von Lindequist, the new Secretary of State, former legal adviser and Governor of GSWA. A rooflight is no substitute for windows to the staircase and its cleaning is problematic: a lightwell was to distance the plenary chamber from the main building which also dampens noise transference. Verandas were to be added to the north elevation where the sun strikes during midday and also along half of the south elevation where during the height of summer a veranda is equally necessary - observations that ordinarily cannot be expected from a bureaucrat! The stark simplicity of the completed building is striking. The hipped corrugated iron roof calmly covers the building and its surrounding verandas. The central projection, a hallmark of a civic or governmental building has been omitted, the central entrance and governor's chambers in the first floor are only defined by the functionally necessary staircase and the slightly projecting portico terminated by wider pillars. The entablature had been removed, it would not conform to an architectural expression based entirely on functionality. Its austerity is based on a building tradition locally and rationally developed with remarkable concern for the physical comfort of the users. The building's role as an image must as a consequence be suppressed, it has even been separated from the desire for an association with the mother country! The Tintenpalast is thus the climax and entirely logical conclusion to the veranda style which was based on the concern for creating buildings that would serve their purpose in the simplest and most unaffected way. Here the SWA Veranda Style achieves an extraordinary scale giving it a claim to be a fully fledged architectural style. The development of this veranda architecture brings about an objectivity in building which at the turn of the nineteenth to the twentieth century touches on the threshold of Modern Architecture. The SWA Veranda Style must therefore be seen as an important link between Historicism and Objectivity. It can be regarded as much a breakthrough as the contemporaneous Fagus Shoe Last Factory by Walter Gropius, which like that building is freed from the fetters of eclecticism that stifled architectural innovation s long. The Great War was triggered off in August 1914 when Archduke Ferdinand was assassinated at Sarajevo. In July of the following year GSWA capitulated to Great Britain represented by the forces of the Union of South Africa. In 1921 the League of Nations declared SWA mandated to South Africa. Half of the Germans including all officials and troops with their families were expatriated. A new settler wave from South Africa arrived and in this way a new culture developed with a different architectural dispensation. The new regime did not understand that the present is rooted in the past and that the SWA Veranda Style offered lessons that are abiding. Hence the veranda architecture did not develop further, it remained a microcosm, a self-enclosed world. But the Tintenpalast is no historical relic. It stands proudly today, as it has for seventy years of mandatory government. It is still the seat of bureaucracy, looks astonishingly fresh and well maintained and very much a part of the contemporary life of Windhoek and SWA/Namibia. It has provided its users with a comfortable environment (and that without air-conditioning) both a reproof and a reminder that good design endures. Time has taken its course, SWA is not yet Namibia, but inevitably it will be. Conservation of monuments of a colonial era is a difficulty in any developing country. Yet even their decay can ironically be enjoyed. In Kolmanskop, the original town of the diamond find, abandonment and continuous exposure to sun and wind have resulted in the town taking on a complete new character as a ghost of its former glory. In Elizabeth Bay the mortar has even outlasted the brickwork and unless a new political mortar can be found conservation and rehabilitation of buildings will remain wishful thinking. 1. The name Hartebeest in the context of a building has no connection with the antelope of the same name. The Voortrekkers used the term when referring to houses of hard reeds, or harde biesies. See Walton J. Homesteads and Villages of South Africa, Pretoria: Van Schaik, 1965, p. 97. 3. Prosener, J. Berlin auf dem Wege zu einer neuen Architectur Munich: Prestel, 1979, p. 24. 4. All three volumes were unfortunately not translated when finally in 1979 the book appeared in English: Muthesius, H The English House. London: Crosby Lockwood Staples, 1979. 5. The Architectural giant in Muthesius's eyes was R. Norman Shaw. The reference to Shaw is thus not randomly drawn from the Arts and Crafts architects. 6. Graef, P. & Hinckeldeyn, K. Neubauten in Nordamerika, Berlin: Becker, 1897. 7. Giedion, S. Space, Time and Architecture. Cambridge, Mass: Harvard University Press, 1949, p. 292. 8. Von Estorff, L. Wanderungen und K?mpfe in S?dwestafrika, Ostafrika und S?dafrika, 1894-1910. Wiesbaden: Kutscher, 1968, p. 133. PETERS, W. Baukunst in S?dwestafrika 1884-1914. Windhoek: SWA Scientific Society, 1981.